Kimi Raikkonen: That has nothing to do with style. We simply didn’t have the speed this afternoon on this track. That’s it. Q: So where did the speed go? You’ve had speed at quite a number of races so far. How has it suddenly disappeared? KR: These low downforce circuits are a killer. It wasn’t easy for us last year and obviously the history repeats itself. Q: What have you made of Red Bull’s decision not to sign you but to sign Daniel Ricciardo? KR: The decision had nothing to do with me so why should I waste another thought on it. Q: But you could have imagined driving for Red Bull Racing? KR: We did talk to them, but obviously they wanted something else. It’s fine with me. And anyway it was their decision. Q: In the Monza paddock a lot of people are saying that you’ve already signed for Ferrari. But why would Ferrari go for a headache driver line-up? KR: There is nothing certain. When I know I will let everybody know. KR: I had a good time at Ferrari and only the end went a different way – but that’s how things sometimes go. No hard feelings. And time will tell what I am doing next year. KR: When I have a contract. Q: A driver line-up of Alonso and Raikkonen would definitely add to the excitement of a season, both in and outside the car. But why would Alonso nod through having you as his team mate? KR: Go ask him! But I don’t think that he is the one to decide who is racing for Ferrari. KR: I don’t have a problem with anybody. Q: What about staying with Lotus? Could that be an option? KR: For sure. We had a good year last year and a pretty good 2013. Okay, today was not ideal, but that doesn’t change the fact that we are pretty okay together. We have certain issues and they have to fix them and they can have a good next year. KR: I do my stuff and when people connect theirs to mine that’s not my problem. Q: Spa was not your typical race. How much anger was there having to stop after 25 laps? KR: Yeah, I like Spa. But we weren’t as strong as I would have liked to have been. It’s a bit the same story here. The speed in the race was fine – but then we had that brake issue. It was a bit unlucky. Q: Was it a one-off unlucky or will that haunt you for the next races? Q: So what do you believe in? Material fatigue? Q: Money will be a key factor for teams in 2014 to successfully drive through the massive technical changes. Is there a fear of underfunding that makes you look around? KR: For sure if you have more money your chances of doing things and hiring people are higher. It always helps to have a comfortable financial cushion. It is actually a key factor in Formula One. But resources alone will not be enough in 2014 with these massive changes. Everybody starts from zero but to drive through that it helps if you have more money like the big teams do. Q: Stefano Dominicali said recently that we will likely be surprised by the 2014 pecking order; that what we see today can be irrelevant next year and that a number of people will be betting on the wrong horse. Will you be among them? KR: Nobody knows what is going on next year. At the first test – when everybody will have their car running – then we will know more. Then we will have some sort of evidence. But here again I think that the bigger teams have bigger chances of getting it right. KR: Racing is still the same. And we constantly come up with new things so that will not be an issue. Q: What does Monza mean for you? KR: It’s a nice place with a huge load of history. But you need a good car here because of the low downforce and the kerbs. On top of that, it is the closest race to my home and that makes it pleasant. Q: Needing a fast car in the race: how are your chances of having that tomorrow? KR: So far we’ve always done better in the races. We are not so fast here, but I am sure we can do much better than today. Q: Two races ago you were a hot contender for the title. Now you’ve dropped out of the picture a bit. Will you be at the FIA prize-giving this year? KR: I will know after the last race if I need a black suit. KR: What I can say is that after this race the circuits should suit us better – and hope is on the horizon again. But right now it is a fact that if you fail to do well in a race you drop down in the standings significantly, so let’s see. We are aiming for wins – that’s it. 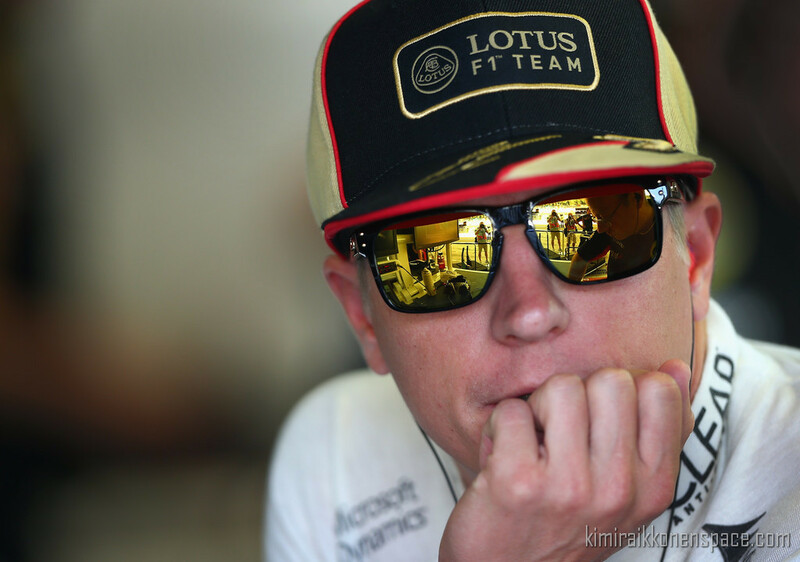 Q: Is there a strategic streak within Kimi Raikkonen? That a win is not always everything, but a strategic result can make your day? Q: Where do you hope to be scoring the big points again – those that get you sharply back on the title contender list? KR: When we go back to the tracks with a normal downforce level. Then we should be okay again. Q: What would be a good afternoon for you tomorrow? KR: When I deliver a good race. That’s our Kimi. Love the interview. Yup! My concern is Kimi going to re-join Ferrari? I’m speechless when seeing the rumurs is getting hot! It sound so real, I hate Ferrari because they asked Kimi to leave before… …No one can tell is the returning will be a right move. Even if he choose to stay in Lotus. For sure it is a gamble! If Kimi doing a good job there then probably he will stay in F1 for another year, if failed I think is is going to retire from there. Kimi has signed contract with Ferrari. Replacing Massa. Base salary is 20 millions of euros per year. Contract is for 2014, 2015 and 2016 optional. The money for transfer will be provided by Shell. Serious? I hv mixed feeling if Kimi returning to Ferrari. This team made him fell & if it is true then i wish he w get 2nd driver champion with them. Most of the most reliable sources have confirmed. AMuS, mirror, Gazzette delo Sport, suomiF1, RTL… also many italian writers are wishing Kimi welcome back on Twitter. Stefano Domenicali confirme it for RTL. I can continue to list the sources. This can’t end like with Red Bull. The story with Red Bull never came this far. We even know the details about contract. Kimi is, by the contract, also allowed to drive rally. He also doesn’t have to go to press conferences if he doesn’t want to. Ferrari has the right to announce WHEREver and HOWever they want, but Kimi has the right to choose WHENever it will be announced. Apart from 20M, there would be bonuses, also. My opinion on Ferrari. I don’t have bad feelings for them if the deal is true. This whole story is like ,,Sorry, Kimi! We need you! Come back!”. As simple as that.